Warm your sweetheart's heart with the simple nourishment of a whole food gourmet meal. 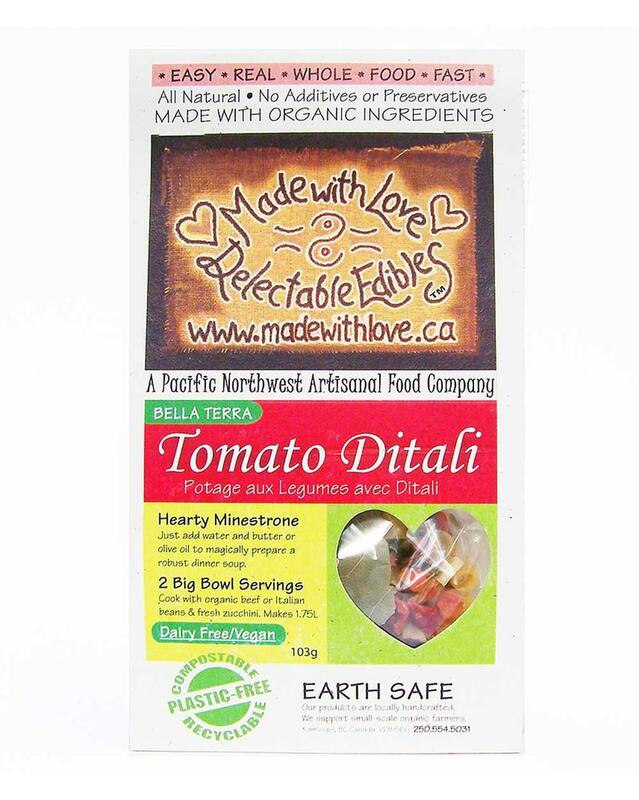 Bella Terra Tomato Ditali Soup Mix creates a scrumptiously good earth indeed. Just add water & olive oil to magically prepare a fabulous Hearty Minestrone Soup. Rich spicy tomato broth with mixed veggies & durum semolina "ditali" pasta. Vegan / Vegetarian with veggie ground round or Omnivorous when cooked with Organic ground beef, bison, chicken or turkey. First, brown some organic ground beef / bison or veggie ground round with a little oil in your soup pot. Add one sliced zuchini. Add 1 can of your favorite Italian beans, drained and rinsed. Add water, olive oil, and soup mix and cook together for 20 mins as directed on package. Top with freshly grated parmesan cheese, and serve with fresh artisan bread from a hot oven with rich creamy unsalted butter and a wedge of asiago cheese. INGREDIENTS: Dried tomatoes, peppers, onions, carrots, leeks, potatoes, cabbage, Ditali (durum wheat semolina) herbs & spices, garlic, raw unbleached turbinado sugar, natural sea salt. 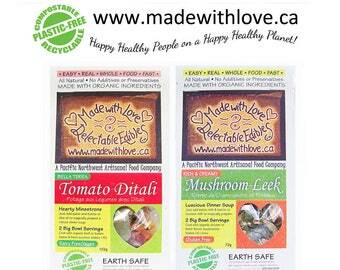 WATCH - EASY REAL WHOLE FOOD FAST - OUR TV COOKING SHOW.